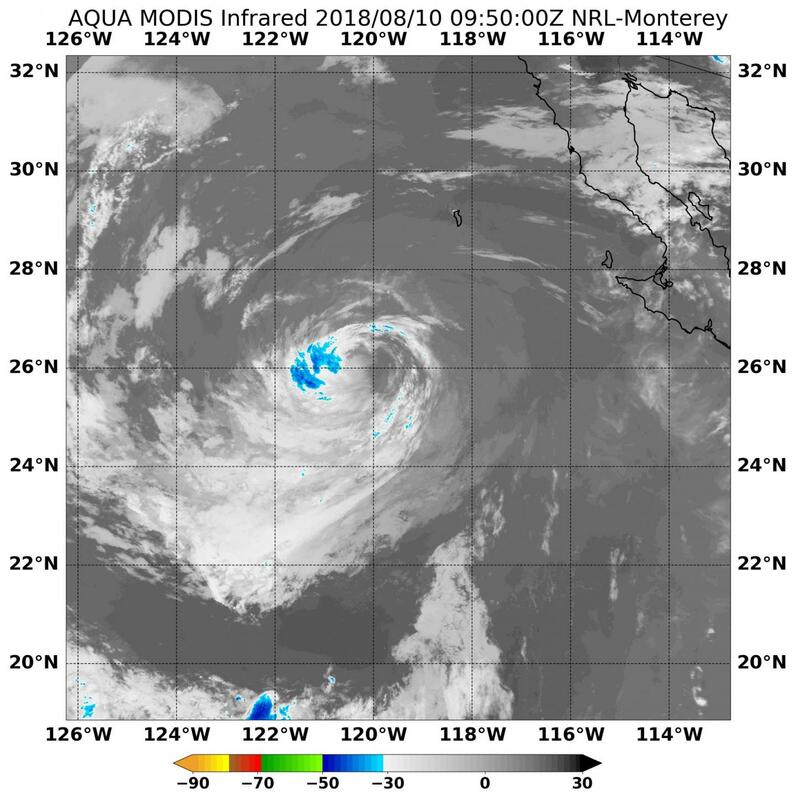 NASA's Aqua satellite passed over the Eastern Pacific Ocean on Aug. 10 and found that Tropical Storm John had the "wind knocked out of it" as a result of moving over cool waters. At 11 a.m. EDT on Aug. 10, the National Hurricane Center or NHC issued the final advisory on John as it weakened to a remnant low pressure area. On Aug. 10. Infrared data from NASA's Aqua satellite analyzed temperature data in the clouds of the former hurricane that showed warm cloud tops and little precipitation. At 4:45 a.m. EDT (0845 UTC) the Moderate Resolution Imaging Spectroradiometer, or MODIS, instrument aboard NASA's Aqua satellite analyzed Tropical Storm John's cloud top temperatures in infrared light. MODIS found cloud top temperatures of strongest thunderstorms around Kristy's low-level center were only as cold as or colder than minus 40 degrees Fahrenheit (minus 40 degrees Celsius), indicating low clouds and weak uplift of air. NHC said "John's convection vanished around 12:30 a.m. EDT (0430 UTC), and the cyclone now consists of a tight swirl of low clouds moving over a 71.6 degrees Fahrenheit (22 degrees Celsius) ocean. Given the lack of convection, the system has been classified as a remnant low." Tropical cyclones need ocean temperatures of at least 80 degrees Fahrenheit (26.6 degrees Celsius) to maintain strength. Colder temperatures can quickly sap a tropical cyclone's strength as was the case with John. The National Hurricane Center (NHC) noted at 11 a.m. EDT (1500 UTC), the center of Post-Tropical Cyclone John was located near 26.8 degrees north latitude and 121.1 degrees west longitude, about 475 miles (760 km) south-southwest of San Diego. The post-tropical cyclone is moving toward the northwest near 10 mph (17 kph), and this motion is expected to continue until dissipation occurs in a couple of days. Maximum sustained winds are near 35 mph (55 km/h) with higher gusts. Additional weakening is anticipated. John may be fading fast but it is still causing ocean swells along the coast. NHC said "Swells generated by John continue to affect portions of the Baja California peninsula and southern California. These swells should begin to gradually subside, but could still cause life-threatening surf and rip current conditions."